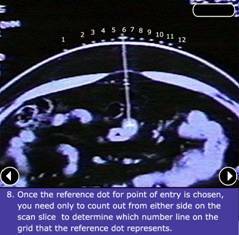 Remove the Biopsy grid and the dot on the skin represents the point of entry of the Biopsy Needle. 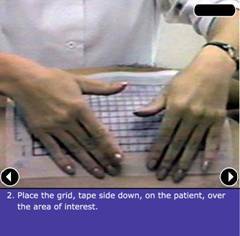 NOTE: The grid can be placed back on the patient by aligning the four reference points marked on the patient with the four on the grid. 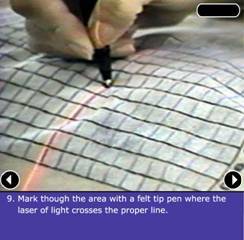 Disposable template grids are for use during brachytherapy and 3D pathologic mapping of the prostate. 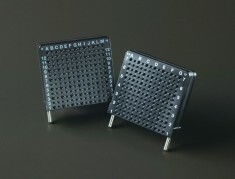 Template grids consist of rows and columns of holes spaced 5mm apart, providing accurate placement of radioactive seeds or radioactive source or other types of implant needle in predefined areas of the prostate. The single use grid is sold sterile and provides a cost effective solution for brachytherapy and 3D pathologic mapping procedures. 7. Low cost: "less than the cost of one seed."